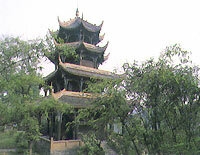 When the Wangjiang Tower, two kilometers east of Chengdu and on the southern bank of the Jingjiang River, was built during the Guangxu Reign of the Qing Dynasty, it was known as Chongli Tower. The tower is a four-floor structure more than 30 meters in height, with the two lower floors laid out on a square plan and the two upper floors assuming a pentagonal shape. The building's beauty of architectural detail is entailed in its sumptuous look. Right beside the tower is the well from which the celebrated Tang dynasty woman poet, Xue Tao, fetched water. The tower is ah surrounded by buildings, and a vast bamboo grove. The Wangjiang Tower is a landmark in Chengdu.